Everything you need to mount on your bike is included in our Pannier Kit. The SU Rack system is compatible with the stock tail rack, and the Happy-Trail Tail Plate System shown in the photos. This bike's geometry is perfect for our exclusive Clif-Cut design. The clif-cut is a 1.5" exhaust cut-out used to create a narrow profile. Select the Denali standard if increased volume is the primary goal as opposed to narrow profile. Note: Clif-Cut panniers create a slight interference with the turn signals on this bike. Just move them slightly, as they are flexible. Tim says: I recommend the Clif-Cut for this bike because of the narrower profile. 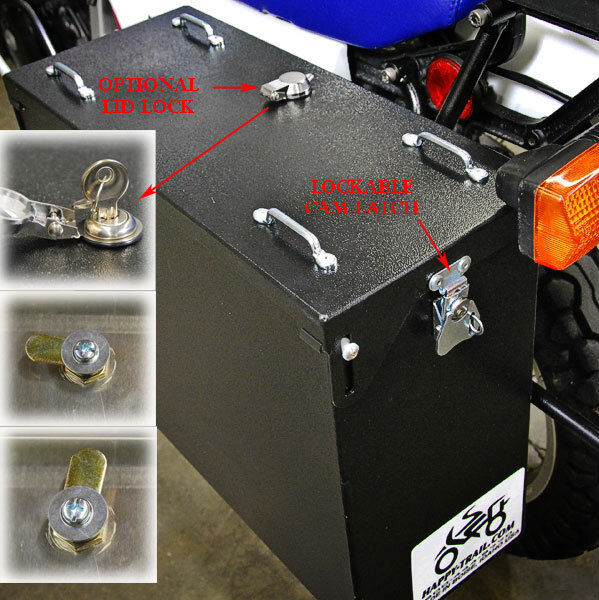 Note that this advantage puts the panniers closer to the top plate, so there is 3" less width for top plate cargo. Top Box Fitment Note: The 33 and 58 Liter Happy Trail Top Boxes will work with Denali standard panniers and all other panniers offered for the V-Strom 650. They do not work with Denali clif-cut panniers. (The clif-cut is a 1.5" exhaust cut-out option available for V-Strom Denali panniers).